Many know Maple Loo as the stylish judge in Showdown 2010. But few are aware that this choreographer, dancer, actress and model is also a successful restaurateur. IT is late morning and some terrapins have climbed onto a rock in the middle of a pond to bask in the sun. They are in the lush, green paradise of Tamarind Springs, a restaurant in Taman Tunku Abdul Rahman, Ampang, where fish wriggle in streams nearby and monkeys are free to jump among the trees. “Sometimes I feel like I’m running an animal hotel,” remarks Maple Loo, emerging like a goddess from the cool, softly lit labyrinths of the restaurant. Multi-tasker: Maple Loo may be busy with her restaurant business but she is still passionate about the performing arts, especially dance. It is clear that she loves animals. The terrapins and fishes had been gifts from her guests and were released in the natural settings of the three-acre restaurant garden. “A rustic oasis”, “an alluring and refreshing escape from the city” – these are some of the phrases used to describe Tamarind Springs, a restaurant that serves traditional Khmer, Laotian and Vietnamese cuisine. Having entered the food and beverage scene seven years ago at the encouragement of her Italian husband, Federico Asaro, 42, Loo has evidently used her experience in the performing arts to inject a sense of dramatic charisma into the restaurant’s design. The result is a place where one does not only eat but also experiences a heightening of the senses, soothed by the glow of flickering oil lamps and the sound of the gurgling fountain in the background. Understandably, the restaurant and its grounds have become the perfect setting for weddings and romantic twosomes. She admits, however, that the beginning was hard. “We had to struggle but we believed in what we were doing and persevered. To date, Loo and Asaro have five restaurants under their name. Three of them, Tamarind Springs, Ii Tempio (an Italian restaurant), and Mandi-Mandi (a Thai-Malay outlet) are located within the same grounds in Taman Tunku Abdul Rahman. The other two are Tamarind Hill and Neo, both located in Jalan Sultan Ismail opposite Equatorial Hotel. The couple also own Japamala Resort, a 14-villa boutique resort in Tioman, and are in the midst of opening Villa Samadhi, a 21-room urban retreat in Jalan Madge off Jalan U Thant, Kuala Lumpur. “All our projects are inspired by Mother Nature. We use second-hand timber and all our properties are built around the natural landscape where we use the beauty of nature to create the ambience. The idea is to make our city restaurants feel like an escape. As it is, our company name, Samadhi, means ‘state of mind’ in Sanskrit,” Loo explains. When Loo is not playing lady boss, she in-dulges in her favourite obsession, pole dancing. She is the owner of Bobbi’s Pole Studio, which is housed in a corner bungalow beside Sucasa Hotel right behind Ampwalk Mall. Speaking of her foray into the entertainment industry, Loo says she started at the age of 19 with the Kit Kat Club and learned the theatrical elements of her art. From there, she went on to pursue a career in entertainment. Even though the restaurant business takes up a lot of her time these days, Loo is still very serious about dance. Dance is an art that should be taken seriously, she professes. And her passion for it shows. In one episode of Showdown 2010, she did what other judges have never done: she gave Wakaka, the eventual champion, a standing ovation. Recalling that moment, Loo confesses that she was just blown away by their creativity. “Dancers are made of passion, not technique. It is about performance skills, energy, stage presence and impact; magic that sometimes doesn’t come from merely applying dance techniques,” she says. She has asked Fat Zuli Sukran, executive chef of Il Tempio, to share a recipe with Sunday Metro. Chef Zul, as he is popularly known, is of Sumatran descent and has over 15 years of experience working for award-winning restaurants in Kuala Lumpur. For reservations and enquiries, visit www.tamarindrestaurants.com and mapleloo.blogspot.com. 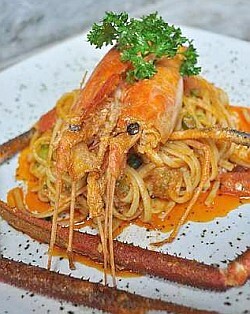 THOUGH Italian by name, the ingredients are inspired by Chef Zul’s childhood days in Kuala Selangor wh ere there was an abundance of life in the rivers. When choosing a river lobster (udang galah), he recommends picking the ones with the brightest blue shells and to avoid those with blackish signs on the underside of the flesh. Split river lobster in the middle taking care not to break it in two. Sauté onions and garlic in olive oil. Throw in river lobster, prawn stock and Italian parsley. Season with salt and pepper. When cooked, remove river lobster and set aside. Boil linguini for 15 minutes. Strain linguini and toss in sauce for two minutes to let flavours seep in. Arrange on plate and top with river lobster. Garnish with tomato cubes and spring onions. Bake prawn and crab shells until brown. In a pot, sauté vegetables (all roughly chopped) until fragrant and add in shells. Pour in 10 litres of vegetable stock (this can be made with any vegetable. Just boil an assortment in water for ½ hour and strain). Boil for eight hours over medium fire. The result should yield about 2 litres. Keep unused stock in freezer.